The world of cars and automobiles is a vast field that covers various forms and types of automobile designs. There are sedans, mini vans, SUVs, and bigger automobiles. However, the most intriguing and innovative design, the coupe is distinguished from other car styles with its distinct 2-door car body that has a permanent fixed-roof. These are almost all the time super cars or race cars modified for commercial use and are fast and furious. There is a separate niche market for such cars with only the most die-hard coupe lovers entering the territory of small, fast and expensive cars. 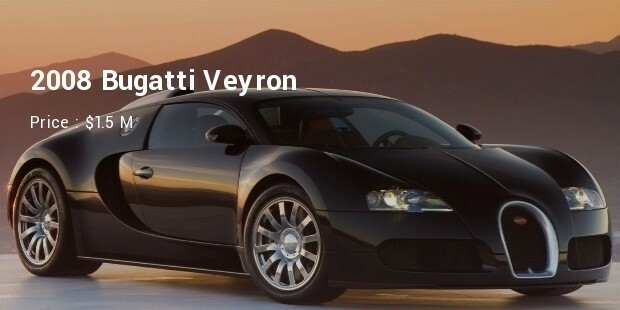 The Bugatti Veyron needs hardly any introduction as it is one of the most well-recognized, popular and powerfully expensive cars in the world today. It is equipped with a tremendous 16-cylinder 8-L engine that produces an immense 1001 Hp. It obviously has a 7-speed transmission system with an all-wheel-drive (AWD) option. 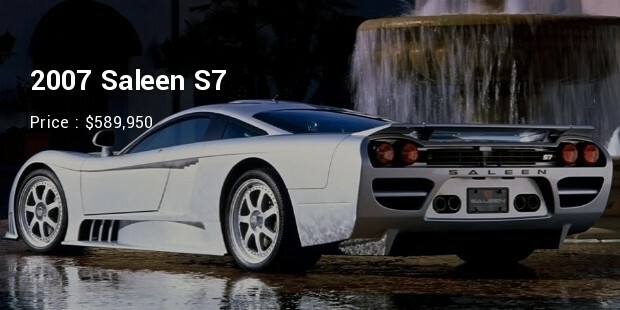 The 2007 Saleen S7 model was hailed as the innovative breakthrough in car racing technology built in a commercial vehicle. Often quoted as the ‘fastest accelerating automobile’, this car is equipped with a 7L, V-8 engine with 6-speed manual transmission for optimum performance on real roads. This car also has other excellent features such as 19 inch front wheels and 20 inch rear wheels for added stability and steering control. 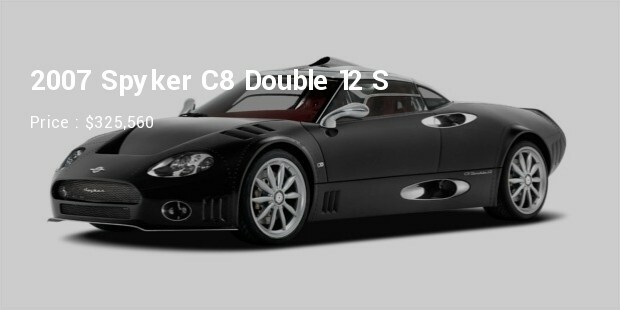 The 2007 Spyker C8 Double 12 S is the most powerful offering from the Spyker brand. Its complete aluminum body encloses a powerful 4.2L, V-8 engine producing a max torque of 620 Hp with the use of a 6-speed manual transmission. 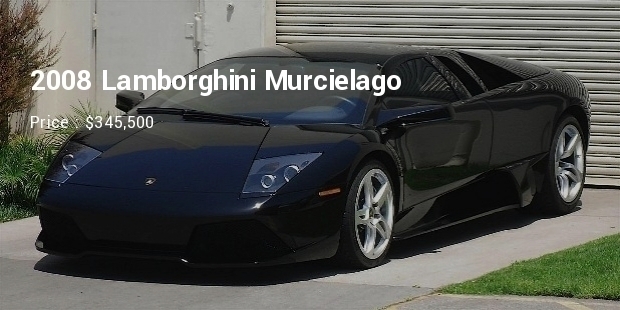 The 2008 Lamborghini Murcielago is also a popular car in the world. This 2-seat coupe/convertible comes with a 6.5L, V-12 engine capable of producing an immense 640 Hp. The AWD (all wheel drive) with advanced electronic traction control make for superior handling and controlling at high speeds. 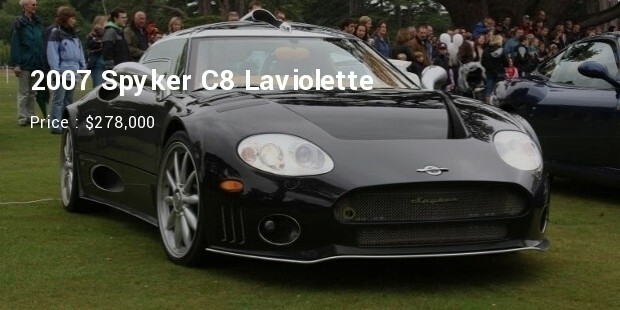 The 2007 Spyker C8 Laviolette is a luxuriously expensive coupe. It is completely hand-crafted for added exclusivity and features a unique all-glass canopy for all-round view while driving. It has a complete light-weight aluminum body which has a 4.2L, V-8 engine producing more than 400 Hp using technology from Audi. 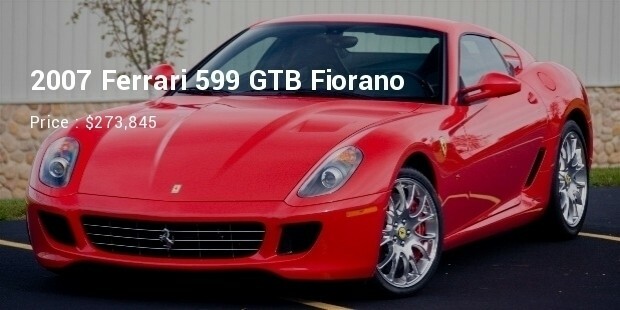 The 2007 Ferrari 599 GTB Fiorano is truly a beast in super cars. This Ferrari comes with a 5.9L, V-12 engine producing around 610 Hp. It comes with a 6-speed semi-automatic fear shift for extra control and acceleration on the road. 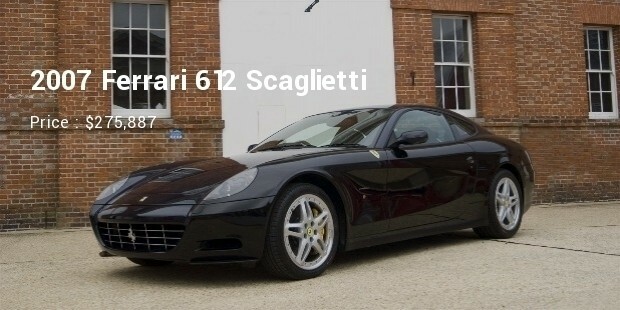 The 2007 Ferrari 612 Scaglietti is a four-seat coupe from the popular Italian super carmaker. This car comes with a 5.8L, V-12 engine producing a tremendous 534 Hp. This high-tech car also features a 6-speed manual transmission or an electro-hydraulic paddle-shift automatic transmission. 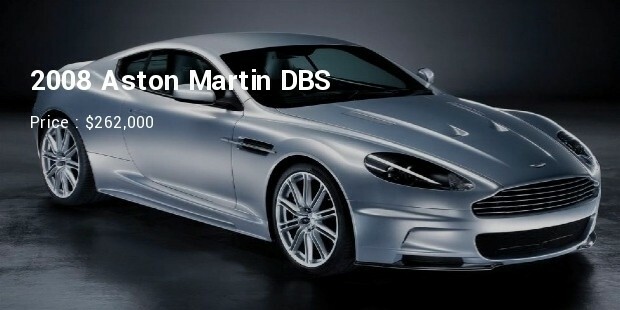 The 2008 Aston Martin DBS is similar to the earlier V8 Vantage and the DB9 models. This is a completely rear-wheel drive coupe which has a powerful 6L, V-12 engine producing around 510 Hp of torque. It comes with a 6-speed manual transmission. 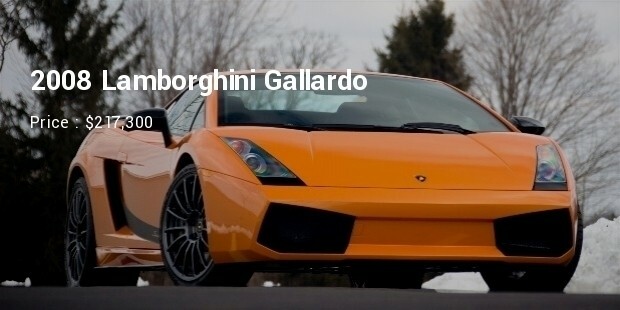 The 2008 Lamborghini Gallardo is a basic 2-door coupe from the Italian carmaker. This comes in a complete light-weight aluminum body and space frame that allows for better power-to-weight ratio. Powered with a 5L, V-10 engine it is capable of producing around 520 Hp with the use of a 6-speed manual transmission. 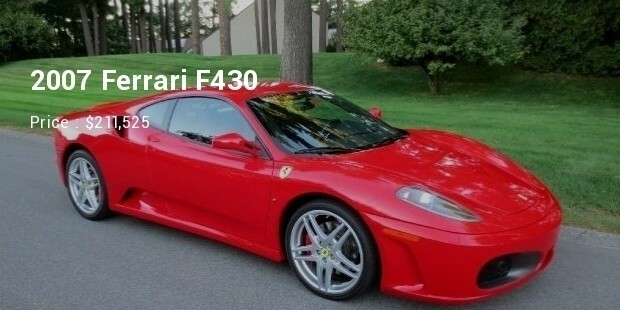 The 2007 Ferrari F430 is a powerful coupe. It features a 4.3L, V-8 engine capable of around 490 Hp. It is mostly hand-crafted by experienced car makers in Italy and was produced as a substitute for the discontinued but popular 360 Modena. These are some of the most expensive coupes in the world. Not only are these cars designed to perfection, but their performance on road in real life is unmatched by any other cars from the other categories. These are small, yet powerful cars that are a rage amongst the fast car lovers from across the globe. Expensive or not, these are truly remarkable for their beautiful bodies enclosing surprisingly powerful engines underneath them.